BUY YOURS NOW AND OWN A PIECE OF HISTORY! OUR BRAVE MILITARY AND FIRST RESPONDERS! Description: Die-Struck Brass Metal, 3-D relief, 2" (50mm) diameter, 1/8" (4mm) thickness, Antique Brass Plating, Diamond-Cut Swirl Edge, and Black Velvet Pouch. "IN GOD WE TRUST" laser etched on the top edge. Please note the beautifully crafted 3-D relief of the American Bald Eagle and Statue of Liberty. Examine the 3-D relief of the Pentagon, feeling the 3-D relief between your fingers is even better! We are proud of the quality, workmanship, and authentically. Each 9-11 / 10th Anniversary "NEVER FORGET" Challenge Coin comes in a soft velvet pouch. "The coins are so beautiful!!!!!!!!! The Soldier's Memorial broke me down. I cannot thank you enough for... making this happen"
"That is absolutely one of the most beautiful coins I have seen." COINFORCE.com is OWNED and OPERATED by Retired Military Veterans. Owners Jordan and Donna Haines have a combined 42 years of active-duty service in the United States Air Force. 1. 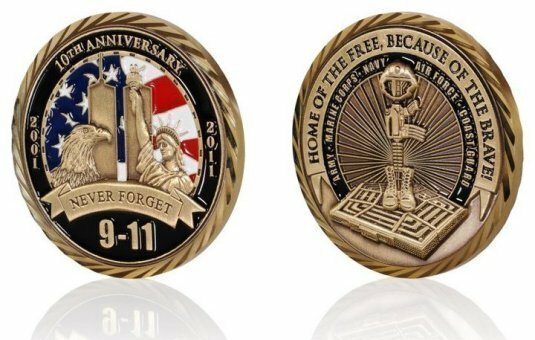 This authentic custom military challenge coin keeps the memory of those who died on 9-11 forever alive in our hearts and minds and reminds us to "NEVER FORGET" what was done to our great nation on that tragic day. 2. The 9-11 / 10th Anniversary "NEVER FORGET" Challenge Coin also pays tribute to our warriors who are serving, have served, and those who have made the ultimate sacrifice. HOME OF THE FREE, BECAUSE OF THE BRAVE! 3. Help us (COINFORCE.com) raise funds that will directly benefit the USO, The American Legion, Veterans of Foreign Wars (VFW), Fisher House, The Gary Sinise Foundation, military units from all five service branches, and metro police and fire departments across the U.S. Funds raised will support programs and services for active-duty military, military families, veterans, wounded warriors and first responders. Please Tell Everyone About... COINFORCE.com!